Paul Le Blanc has played a key role in the recent revival of academic interest in the life and work of Lenin. This has been valuable for two distinct, and not unrelated, reasons. First, helping to blow away the cobwebs of misinterpretation that have accumulated over decades regarding the first leader of the Soviet republic; and also for stimulating wider, strategic discussions on the left about the prospects for revolutionary change in the 21st century. Lenin’s career as an activist and theorist was dominated by crucial questions such as the relationship between the revolutionary party and the working class; the role of reformism in capitalist societies; and the link between radical movements in the West and the rest of the world. In this short but stimulating volume, Le Blanc seeks to initiate a similar renewal of serious study concerning the figure who acted as Lenin’s most prominent collaborator in these discussions. Trotsky did not always agree with his partner in revolution on the answers to these issues, but the debates between the two men over many years collectively provided the most valuable source of guidance for revolutionaries in the last century. Even more significantly, of course, the partnership between Lenin and Trotsky provided the cornerstone of the world’s first, and so far only, workers’ state. Although Le Blanc is ambivalent over the ongoing relevance of that achievement, he has no doubt about the stature of the eponymous figure in terms of commitment and courage. The author pays generous tribute particularly to Trotsky’s unyielding revolutionary commitment in the last decade of his life: ‘Trotsky’s primary purpose, in his final exile, was to share as much as possible, as widely as possible, with actual and potential revolutionary activists before his mind blinked out of existence’ (66). The focus of Le Blanc’s book is with this final period of Trotsky’s life in the 1930s when he had been driven out of Russia by Stalin and was seeking to build a new revolutionary current from a variety of locations including Turkey, France and Mexico. This is a perspicacious decision by the author, and one that is justified with reference to Trotsky’s own words: ‘The work in which I am engaged now, despite its extremely insufficient and fragmentary nature, is the most important work of my life – more important than the period of the Civil War or any other’ (quoted 12). It was during these years that Trotsky produced many of the works that are generally regarded as his greatest legacy to future generations of activists: his classic history of the October Revolution; the commentaries on the rise of Hitler in Germany and of Franco in Spain; and his pioneering attempt to grapple with the class nature of the regime in Russia. Many of Trotsky’s supporters would agree that his role in keeping the flame of revolution alive during that ‘midnight of the century’ was crucial and one that could not have been performed by any other person. Le Blanc is inclined to agree: ‘Trotsky was labouring to provide historical knowledge, theoretical insights and other political resources that new generations of activists could use to rebuild the necessary revolutionary alternative’ ( 12). The perspective on Trotsky adopted throughout is broadly sympathetic but, curiously, Le Blanc insists on underlining the supposed ‘unoriginality’ of his subject’s thought (13). 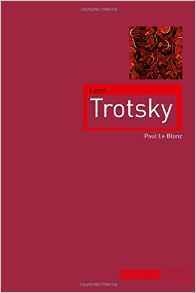 This will strike many readers from a leftist background as counter-intuitive, to say the least, as Trotsky is usually credited, even by his ideological enemies, as a relentless reviser of the tradition handed down by the first generation of Marxism. Le Blanc,however,claims: ‘His distinctiveness is that, unlike many, he sought to remain true to the old revolutionary perspectives, and in a sense became original simply through applying old principles-as consistently and creatively as he could-to new realities’ ( 14). The overall effect of this eccentric reading of Trotsky is, regrettably, to diminish his contribution to the revolutionary tradition, and may leave the reader with a view of its subject as a stubborn relic of a failed project who failed to adjust to the twists and turns of history. It is highly likely this was not Le Blanc’s intention; nevertheless, by seeking to reduce the pioneering dimension of Trotsky‘s thought, it would be difficult for readers new to the subject to arrive at any other conclusion. The author claims that a number of the ground-breaking conceptual formulations widely attributed to Trotsky are, in fact, little more than modifications of perspectives devised by earlier generations of theorists in the Marxist tradition. These areas of Trotsky’s output, he claims, include ‘the much-vaunted theory of permanent revolution, his analysis of Stalinism’ and ‘his prescription for defeating Hitler’. Le Blanc posits: ‘All these are drawn from Marx and from revolutionary Marxists of Trotsky’s own time, including the best of Second International Marxism … as well as the collective project of the early Third International’ (14). A critical approach to revolutionary icons of the past is frequently a healthy exercise but in each of the issues he selects, the author is wide of the mark and fails to identify the essential ‘originality’ of Trotsky’s theoretical contribution. Regarding the notion of permanent revolution he asserts: ‘Far from being the unique innovation of Leon Trotsky, it is a perspective that flows naturally from the revolutionary conceptualisations inherent in the analyses and methodology of Marx himself’ (81-2). Le Blanc provides minimal textual evidence for this view, seeming to argue that because Marx and Engels coined the term ‘permanent revolution’ they should be regarded as its most significant proponents. He briefly adds that the two thinkers even went as far as considering its possible application to Russia (81). Although this is incontrovertibly the case, it should be noted that the two thinkers, writing in the 1880s, based it on the assumption that Russia’s rural commune system might enable the country to skip the capitalist stage of development. By the turn of the twentieth century, however, most informed observers within the Second International, notably Lenin and Plekhanov, had recognised the scale of Russia’s industrial development had rendered such an aspiration obsolete. Le Blanc justifiably points out other Marxist theorists, especially Alexander Parvus, were moving in a similar direction to Trotsky regarding permanent revolution, but the crucial point is that only the latter was in a position of intellectual and practical influence in the pre-1917 period to make it happen. Trotsky was the only figure of substance in the senior Bolshevik leadership at the time who stressed the impossibility of the Russian peasantry acting as an independent force for change, and that only the nascent working class could play the leading role in a revolution. Also, Le Blanc fails to explain adequately the link between Trotsky’s theories of permanent revolution and that of combined and uneven development. The two formulations are elucidated in sequence but without their crucial connection being highlighted sufficiently (78-9). The success of the former, for Trotsky, was predicated on the latter providing the material base for the small Russian working class to construct a socialist economy with assistance from, hopefully, revolutions triggered in Western Europe. It is also a shame Le Blanc does not take the opportunity in this section to explore the ongoing relevance of these two concepts in our century. The 2011 series of Arab Spring revolutions once more demonstrated that mass revolts of the oppressed should be expected on a regular basis in the southern hemisphere, but that their aspirations will only be fulfilled if they are spearheaded by a working class with a conscious, revolutionary minority prepared to challenge for state power. The same could be said for the anti-apartheid struggle in South Africa at the end of the last century. Having discussed the supposed ‘unoriginality’ of permanent revolution,Le Blanc proceeds to examine critically Trotsky’s account of the rise of Stalinism in Russia and the ending of the era of revolutionary optimism inaugurated by the October Revolution. Once again, the author argues there is no startling theoretical innovation contained within the critique devised by Trotsky of the post-Lenin regime. Instead,Le Blanc remarks, his subject ‘sees it as related to the more general development of a bureaucratic, conservative dynamic naturally deriving from historical circumstances and conditioned by specific economic realities, involving an analytical methodology quite recognisable to Marx’ (86). Once more, the author fails to elaborate precisely what ‘analytical methodology’ he is referring to, but appears to be accusing Trotsky of falling into line with contemporary notions of bureaucratism and totalitarianism that were floating around in intellectual circles in the 1930s, propagated by the likes of Bruno Rizzi and, most famously, Orwell in 1984. Although, Trotsky undoubtedly struggled to come to terms with the class nature of the USSR, at no point did he resort to ahistorical generalisations about ‘bureaucracy’ or abandon the Marxist method of rooting analyses in actual historical development. He did commit critical theoretical errors, such as misreading Stalin’s launching of collectivisation in 1928 as a marginally progressive shift to the left, aimed at curtailing Bukharin and the Right of the Bolshevik Party. Also, as Le Blanc more persuasively suggests, Trotsky’s ultimate characterisation of Stalin’s Russia as a ‘degenerated workers’ state’ unfortunately bequeathed to his followers a self-contradictory and untenable formulation that increasingly stretched credibility, especially when the putative workers’ state began smashing proletarian uprisings in East Germany, Hungary and Poland after World War Two (163). Le Blanc, however, does not give Trotsky sufficient credit for being the first major left-wing thinker to attempt a materialist explanation for the fate of the October Revolution, or appreciate the difficulty his subject faced in trying to resolve an entirely new conceptual problem in the history of Marxism. Nevertheless, on the question of Stalinism, Le Blanc should be commended for reminding us of the heroic sacrifice of Trotsky’s small band of supporters in Russia during the darkest days of Stalinist terror. The most moving passages of the book concern the resistance of die-hard Trotskyists at the Vorkuta prison camp in Siberia in the late 1930s, finally quashed by mass executions of hundreds of men, women and children. As Le Blanc recounts: ‘as one large group of about a hundred was led out of the camp to be shot, the condemned sang the ‘’Internationale’’ joined by the voices of hundreds of prisoners remaining in camp’ (123). As the remnants of his support was being liquidated in the USSR, Trotsky was in exile trying to come to terms with the rise of fascism to state power in Germany and Spain. The analyses he developed concerned the failure of the left in those two respective countries to stop the far right taking power probably represent his most durable legacy to socialists in this century. Trotsky’s contemporary journalism on the two situations drew particular attention to the calamitous failure of the various sections of the left in each country to combine their forces to fight the common foe. In contrast to both the sectarian myopia of the ultra-left and the class collaboration of the leadership of the centre-left, Trotsky advocated the strategy of the united front. As explained by Le Blanc this was ‘the notion that a working class divided between reformists and revolutionaries could defend and advance its interests through a fighting unity, the united front, and that within this context the revolutionaries, as the most effective fighters, could ultimately win the adherence of a working class majority’ (89). The modest but significant rise of the far left in Europe today has been, indirectly, based on adaptations of Trotsky’s policy; formations such as Syriza in Greece, Podemos in Spain and the Radical Independence movement in Scotland have pooled the resources of reformists and revolutionaries to raise the international profile of the left. The results have been mixed, but the united front does seem to offer the best model for re-asserting the relevance of the left in advanced capitalist societies. Although Le Blanc lucidly outlines his subject’s thinking on this issue, the author at this point appears to forget his explicit agenda of undermining the case for Trotsky’s originality! He does not offer any substantial evidence to contradict the view that the united front strategy was primarily the legacy of Trotsky. He does point out it was devised in collaboration with Lenin and the early leaders of the Comintern but that hardly lessens the importance of his subject (89). Trotsky’s status in the front ranks of Marxist thinkers is ultimately left untouched by Le Blanc’s efforts to demote him. Although the author provides a readable and frequently insightful guide to his subject’s life and times, the book falls short as an ideal introduction. Conspicuously absent is an appreciation of the dialectical quality of Trotsky’s thought; namely, his ability to weave together politics, economics, philosophy, culture and science to create an integrated picture of the various topics he sought to analyse. Antonio Labriola, the Italian philosopher, is not mentioned but his influence on Trotsky in terms of shaping his world-view is essential to understand how the latter developed the ability to analyse issues on multiple levels. Trotsky’s grasp of the dialectic enabled him to endure personal blows that would break most people and still be able to declare on the eve of his assassination: ‘Life is beautiful. Let the future generations cleanse it of all evil, oppression and violence and enjoy it to the full’ (quoted 178). The application of this to his distinctive theory of permanent revolution is insisted upon in other comments Trotsky makes, for example in the 1922 preface to “1905”, as well as in “The New Course”, “My Life”, and “Stalin”. There are a number of works – David Riazanov’s “Karl Marx and Friedrich Engels”, Teodor Shanin’s “Late Marx and the Russian Road”, Richard Day’s and Daniel Gaido’s “Witnesses to Permanent Revolution”, my own newly republished “From Marx to Gramsci” – that illustrate the truth of Trotsky’s assertions. “Two years before the Communist Manifesto, young Marx wrote: ‘A development of the productive forces is the absolutely necessary practical premise [of Communism], because without it want is generalized, and with want the struggle for necessities begins again, and that means that all the old crap must revive.’ … Limousines for the ‘activists’ [that is, the bureaucrats], fine perfumes for ‘our women’ [that is, wives of the bureaucrats], margarine for the workers, stores ‘de luxe’ for the gentry, a look at delicacies through the store windows for the plebs – such socialism cannot but seem to the masses a new re-facing of capitalism, and they are not far wrong. On a basis of ‘generalized want’, the struggle for the means of subsistence threatens to resurrect ‘all the old crap,’ and is partially resurrecting it at every step. Thanks Paul for clarification. I think we are on the same page in terms of recognising Trotsky as someone who remains relevant to the 21st century left and the challenges it faces. I agree that he was always keen to root his analyses in the tradition of classical marxism,and if that is what Paul means by ‘unoriginality’ I can see where he is coming from. However I still feel there are problems with prioritising Trotsky’s references to Marx as the fulcrum of his critique of Stalinism. Marx could not possibly have anticipated the predicament of a workers’ state clinging on for survival in an overwhelmingly rural economy,with an already small proletariat collapsing in size even further due to external invasion by 15 foreign armies. Trotsky may have been influenced by Marx’s ‘analytical methodology’ but far more important to him would have been the fluid power relations in the years just before and after 1930 between the Stalinised bureaucracy,the kulaks,the NEPmen and the working class. The dynamics among these concrete social forces in that decisive period was the focus of his unprecedented attempt to identify the nature of a socialist revolution that was mutating into something Marx could only have dimly foreseen. I agree with Paul that ‘Trotskyism’ is a problematic term but would disagree that it should now be jettisoned from the vocabulary of the left. At its best,it represented the survival of the notion of workers’ self-emancipation in the decades after WW2 when capitalism appeared all powerful in the West and Stalinism likewise in the East. The fact that any form of far left activism lives on is due in no small part to Trotsky’s heroic endurance.